INDIO, CA - N.W.A has teased a reunion since last year's BET Experience performance where Ice Cube performed with MC Ren and DJ Yella. The three united again at Cube's first Coachella performance last week and this weekend, the group welcomed Dr. Dre and Eazy-E's son, Lil Eazy-E to the festival's stage to finally complete the reunion. According to Rolling Stone, MC Ren, DJ Yella and Ice Cube performed "Straight Outta Compton" and Lil Eazy-E gave a rendition of his father's "Boyz-N-the-Hood." "We missing somebody, if you know what I mean," Cube says to the crowd after these performances. "Is there a doctor in the motherfucking house?" Dr. Dre did not perform any N.W.A songs and opted for Tupac's "California Love" and his own "Still D.R.E." 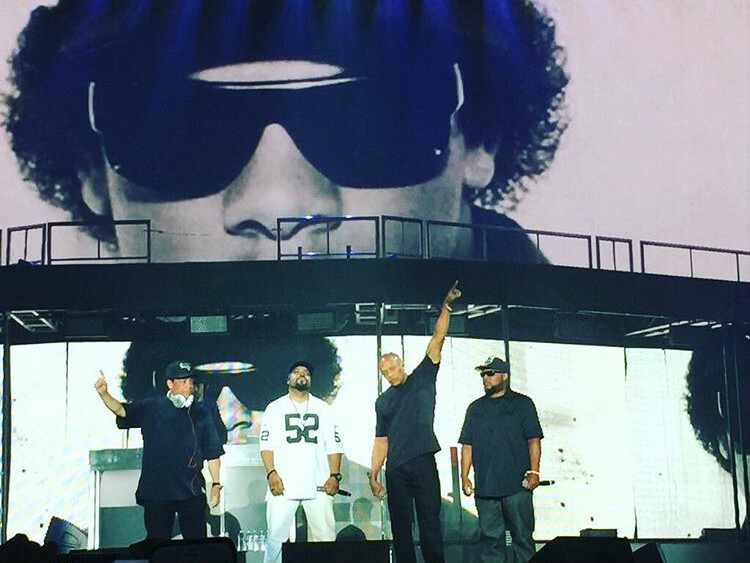 An image of Eazy-E was projected on the wall, bringing the five members together. The Ruthless Records founder died from complications due to AIDS in 1995. Kendrick Lamar also came out and performed "Alright" during Ice Cube's set. The Compton, California rapper inducted N.W.A into the Rock and Roll Hall of Fame earlier this month.